Boot into single user mode when FreeBSD boot menu presented. Press enter when prompted "Enter full pathname of shell or RETURN for /bin/sh:"
Okay, I've "re-owned" my box again. But hay, isn't that a bit to easy for "others" to access it as well??? Ya, I think so too. This calls for some digging into the FreeBSD Handbook. It has everything a Sys Admin needs to know, from installation to security and fine tuning servers. 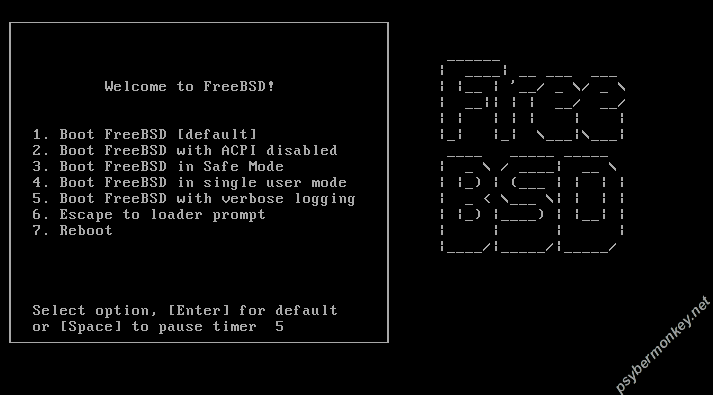 That's why I like FreeBSD, the documentation is superb !!! Enough talking, turn to page 12, chapter 6, paragraph 2. Reboot the box and boot into single user mode, if you wanna test it. By the way, the keyword "insecure" imply to the console is insecure and thus required root password to be authenticated before single user mode can be access. It DOES NOT mean that the console is run insecurely. Take note. Now, the single user mode is protected with root password authentication. Does that mean that the root password cannot be reset anymore, if forgotten(again???)? Boot the box using Fixit CD. When the "sysinstall" menu is presented, select option "Fixit" then "CDROM/DVD Use the "live" filesystem CDROM/DVD". Mount the root's partition to /mnt/ directory, e.g. where "rootpart" is the root partition mount point. Physical access to any box is as important as any security aspect (software & OS). It deserves attention. Lock your box not only using password authentication, but also using keys.